, a man of very uncommon parts and learning, and the chief support of the Arminian sect, was descended from a reputable protestant family, and born at Amsterdam in 1583. Having a numerous fraternity, and his parents not very rich, it was doubted for some time whether he should be brought up to learning; but, appearing to have a strong disposition towards it, his friends determined to encourage him in the pursuit. After he had gone through the Latin schools at Amsterdam, he went to study at Leyden, in 1602. His father died of the plague in that same year, and his mother in 1604; neither of which calamities, however, in the least retarded his studies. He was admitted M. A. hi 1606, and thenceforward applied himself wholly to the study of divinity, in which he made so great progress, that he was judged in a short time quaJified for the ministry. The magistrates of Amsterdam wished he might be promoted to it; but he met with many difficulties, because during the violent controversy between Gomarus and Arnjjnius about predestination, he declared for the latter. This made him desirous to leave the university of Leyden, and he went to Fraueker in 1609, bur. did not continue there long, for he found that by | disputing too vehemently, he had exasperated the professor Lubertus, who was a zealous Gomarist. 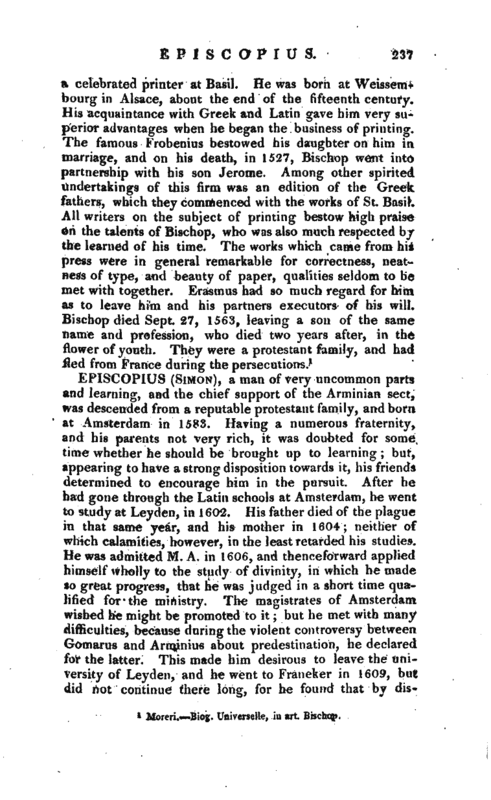 Arminius was at that time labouring under the illness of which at length he died; on which account Episcopius went to visit him at Leyden, and had many conferences with him upon religion, and the state of the church. He afterwards, returning to Franeker, had more disputes with Lubertus. His adversaries now began to charge him with Socinianism; and Lubertus was so severe in his reprehensions of him, that he left Franeker, and returned to Holland. Here he was ordained in 1610, and made minister of the village of Bleyswyck, which was dependent upon Rotterdam. He was one of the deputies in the conference held at the Hague in 1611, before the states of Holland, between six anti-remonstrant and six remonstrant ministers; and here he displayed his wit and learning to the greatest advantage. In 1612 he was chosen divinity-professor at Leyden, in the room of Gomarus, who had voluntarily resigned; and lived in peace with Polyander his colleague, though they held contrary opinions about predestination. 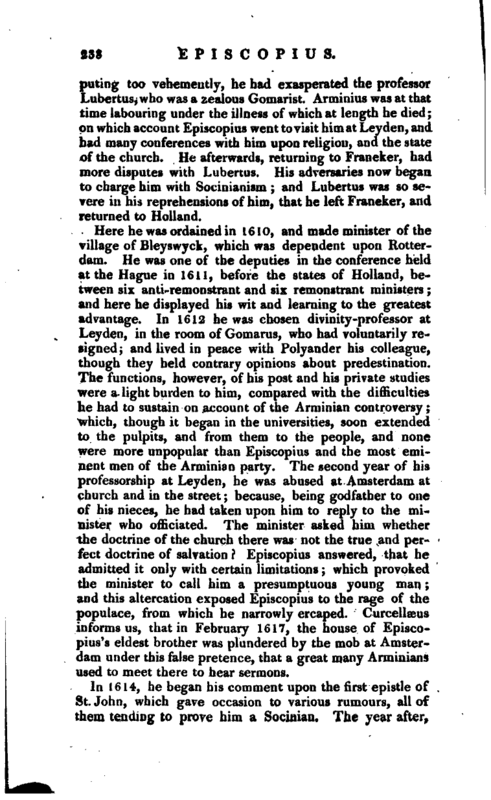 The functions, however, of his post and his private studies were a light burden to him, compared with the difficulties he had to sustain on account of the Arminian controversy; which, though it began in the universities, soon extended to the pulpits, and from them to the people, and none were more unpopular than Episcopius and the most eminent men of the Arminian party. The second year of his professorship at Leyden, he was abused at Amsterdam at church and in the street; because, being godfather to one of his nieces, he had taken upon him to reply to the minister who officiated. The minister asked him whether the doctrine of the church there was not the true and perfect doctrine of salvation Episcopius answered, that he admitted it only, with certain limitations which provoked the minister to call him a presumptuous young man and this altercation exposed Episcopius to the rage of the populace, from which he narrowly ercaped. Curcellaeus informs us, that in February 1617, the house of Episcopius’s eldest brother was plundered by the mob at Amsterdam under this false pretence, that a great many Arminians used to meet there to hear sermons. In 1614, he began his comment upon the first epistle of St. John, which gave occasion to various rumours, all of them tending to prove him a Socinian. The year | taking the opportunity of the vacation, he went to Paris, for the sake of seeing that city; but his object was immediately misrepresented, and on his return home, his adversaries published, that he had had secret conferences with father Cotton, in order to concert the ruin of the protestant church and the United Provinces that he avoided all conversation with Peter du Moulin, minister at Paris or, as others say, that the latter declined all conference with him, seeing him so intimate with the enemies of his country, and of the protestant religion; and although there was little truth in these reports, it was not easy for Episcopius to prove his innocence. The states of Holland having invited him to come to the synod of Dort, that he might take his place in that assembly, as well as the other professors of the Seven United Provinces, he was one of the first that went thither, and was accompanied by some remonstrant ministers. But the synod would not suffer them to sit in that assembly as judges, nor admit them but as persons summoned to appear. They were obliged to submit, and appear before the synod. Episcopius made a speech, in which he declared, that they were all ready to enter into a conference with the synod; but was answered, that the synod did not meet to confer, but to judge. They excepted against the synod, and refused to submit to the order made by that assembly: which was, that the remonstrants should neither explain nor maintain their opinions, but as far as the synod should judge it necessary. Upon their refusing to submit to this order, they were expelled the synod and measures were taken to judge them by their writings. They defended their cause with the pen and Episcopius composed most of the pieces they presented on this occasion, and which were published some time after. The synod then deposed them from their functions; and because they refused to subscribe a writing, which contained a promise not to perform privately any of their ministerial functions, they were banished out of the territories of the commonwealth in 1618, and took up their residence at Antwerp: as thinking themselves there in the best situation to take care of their churches and families. 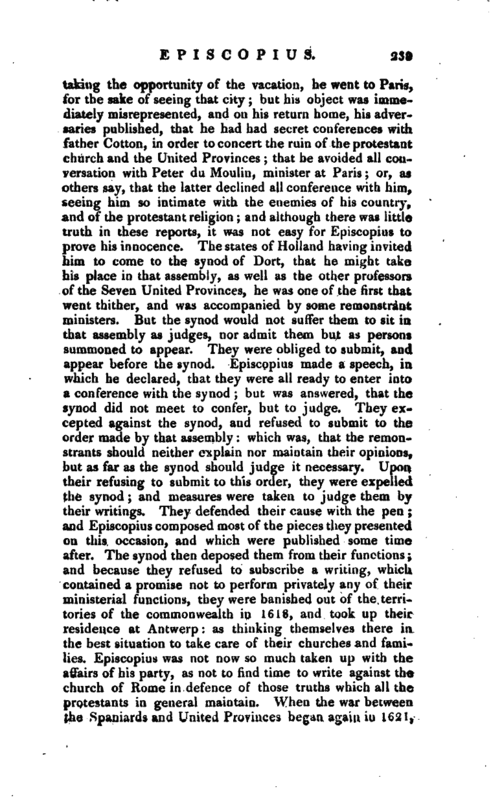 Episcopius was not now so much taken up with the affairs of his party, as not to find time to write against the church of Rome in defence of those truths which all the protestants in general maintain. When the war between tho Spaniards and United Provinces began again in 1621, | he went to France; and there laboured by his writings, as much as lay in his power, to strengthen and comfort his brethren. He not only composed, in common with them, “A confession of faith;” and published, soon after, his “Antidote against the canons of the synod of Dort,” but he also disputed with great strength of argument against Wadingus, a Jesuit; who treated him very kindly, and, taking an advantage of the difficulties he saw him under, endeavoured to persuade him to enter into the pale of his church. The times being grown more favourable, he returned to Holland in 1620; and was made a minister of the church of the remonstrants at Rotterdam. He married the year after, but never had any children by his wife, who died in 1641. In 1634 he removed to Amsterdam, being chosen rector of the college which those of his sect had founded there, and continued in that post till his death, which was preceded by a tedious and gradual decline. August 1640, hiring a vessel, he went with his wife to Rotterdam but in the afternoon, while he was yet upon Ins voyage, a fever seized him and, to add to his indisposition, about evening came on such a storm of thunder and fain as had not been known for many years. All these hindrances made them arrive so late at Rotterdam, that the gates of the city were shut: and the long time he was obliged to wait, before he could get them opened, increased his disorder so much, that he was confined to his bed for the four following months. He recovered; yet perceived the effects of this illness, in the stone and other complaints, as long as he lived. He died the 4th of April, 1643, having lost his sight some weeks before. 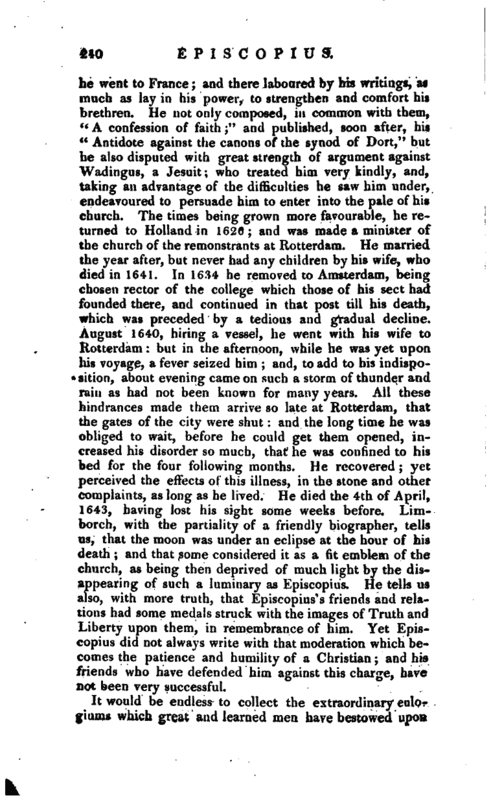 Limborch, with the partiality of a friendly biographer, tells us, that the moon was under an eclipse at the hour of his death; and that some considered it as a fit emblem of the church, as being then deprived of much light by the disappearing of such a luminary as Episcopius. He tells us also, with more truth, that Episcopius’s friends and relations had some medals struck with the images of Truth and Liberty upon them, in remembrance of him. Yet Episcopius did not always write with that moderation ‘which becomes the patience and humility of a Christian; and his friends who have defended him against this charge, have not been very successful. 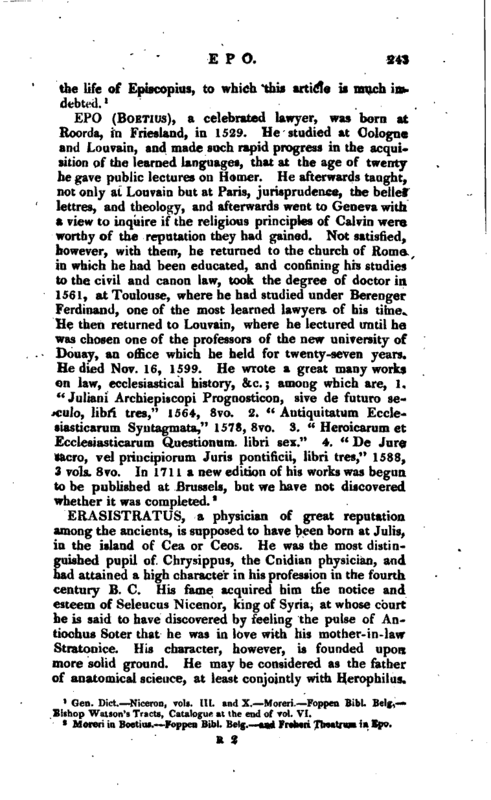 It would be endless to collect the extraordinary eulogiums which great and learned men have bestowed upon | Episcopius; one of which may be quoted as coming from an unexpected quarter, from Mabillon, an eminent member and ornament of the church of Rome: “I cannot forbear observing in this place,” says he, in his treatise of studies proper for them that live in monasteries, “that, if some passages had been left out of Episcopius’s theological institutions, which Grotius esteemed so much that he carried them with him wherever he went, they might have been very useful in the study of divinity. This work is divided into four books; the method of which is quite difr ferent from that which is generally followed. His style is beautiful, and his manner of treating his subjects answers his style perfectly well; nor would the time spent in reading of it be lost, if it was corrected with regard to some passages, in which the author speaks against the Roman catholics, and in favour of his own sect.” The Arminians have had very naturally the highest regard for Episcopius, and been careful to preserve his reputation from the attacks that have been made upon it: so careful, that, in 1690, they engaged Le Clerc, one of their professors, publicly to accuse Jurieu of calumny, because he had spoken evil of Episcopius. 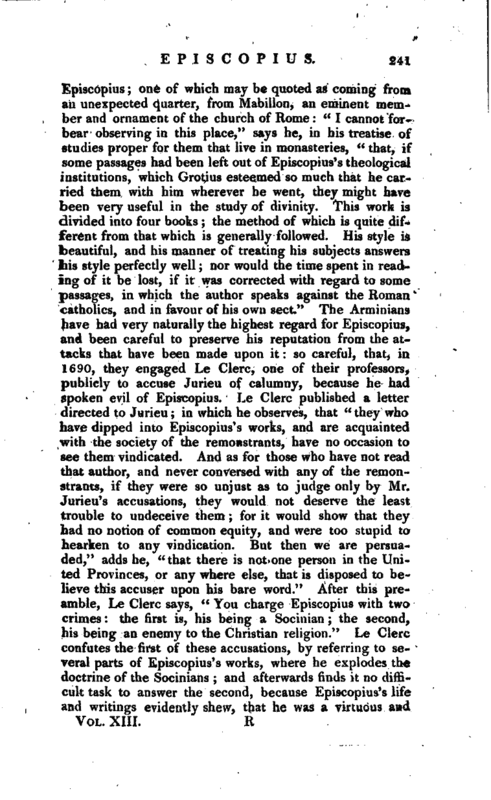 Le Cle.rc published a letter directed to Jurieu; in which he observes, that “they who have dipped into Episcopius’s works, and are acquainted, with the society of the remonstrants, have no occasion to see them vindicated. And as for those who have not read that author, and never conversed with any of the remonstrants, if they were so unjust as to judge only by Mr. Jurieu’s accusations, they would not deserve the least trouble to undeceive them; for it would show that they had no notion of common equity, and were too stupid to hearken to any vindication. But then we are persuaded,” adds he, “that there is not one person in the United Provinces, or any where else, that is disposed to believe this accuser upon his bare word.” After this preamble, Le Clerc says, “You charge Episcopius with two crimes: the first is, his being a Socinian; the second, his being an enemy to the Christian religion.” Le Clerc confutes the first of these accusations, by referring to several parts of Episcopius’s works, where he explodes the doctrine of the Socinians; and afterwards finds it no difficult task to answer the second, because Episcopius’s life and writings evidently shew, that he was a virtuous and | conscientious man, and very zealous for the Christian religion. Le Clerc refers to a-passage in Episcopius’s Institutions, in which the truth of the Christian religion “is proved,” says he, “in so clear and strong a manner, that we might hope there would not remain any infidels in the world, if they would all duly weigh and consider his arguments. And yet you style him, sir, an enemy of Christianity; though it does not in the least appear, that you have either read his works, or examined his life. There is indeed nothing but the disorder of your mind, occasioned by your blind zeal, for which you have been long noted, that can make me say, O Lord, Forgive Him; for, in reality, you Know Not What You Do. You could not choose a better method to pass in the world for a man little acquainted with the duties of Christianity, and even of civil society, than by writing as you have done,” &c. With respect to his opinions on this subject, Episcopius acknowledges that Jesus Christ is called in Scripture the Son of God, not merely on account either of his miraculous conception, or of his mediation, or of his resurrection, or of his ascension, but on a fifth account, which, in his opinion, clearly implies his pre-existence; yet he contends, that it is not necessary to salvation, either to know or believe this fifth mode of filiation because it is not any wherfc said in Scripture to be necessary because we may have faith in Christ without it and because for the three first centuries the Christian church did not esteem a profession of belief in this mode to be necessary to salvation. 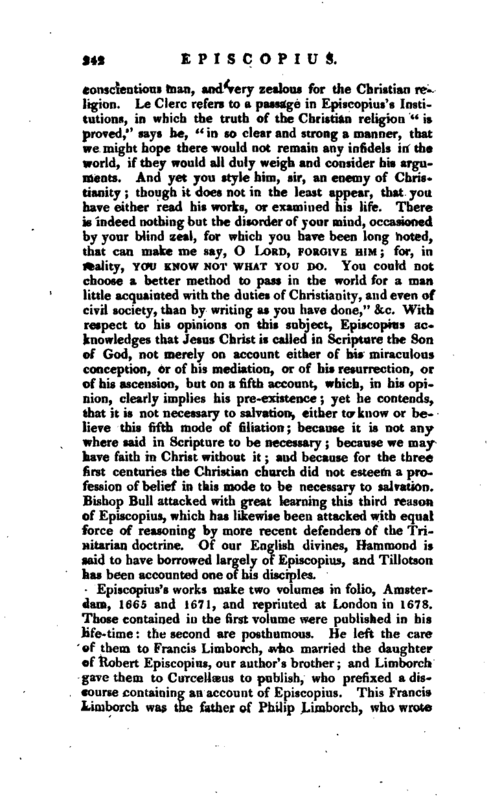 Bishop Bull attacked with great learning this third reason of Episcopius, which has likewise been attacked with equal force of reasoning by more recent defenders of the Trinitarian doctrine. Of our English divines, Hammond is said to have borrowed largely of Episcopius, and Tillotson has been accounted one of his disciples. Gen. Dict.—Niceron, vols. III. and X.—Moreri.—Foppen. Bibl. Belg.— Bishop Watson’s Tracts, Catalogue at the end of vol. VI.